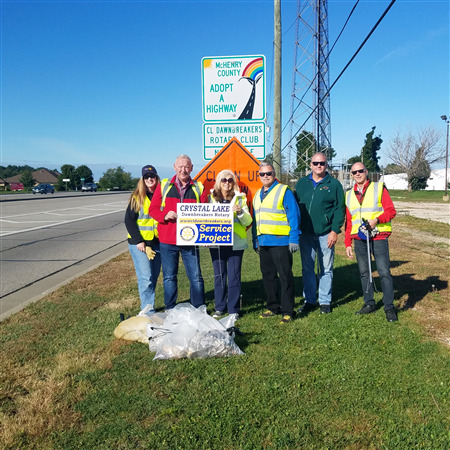 Fall Road Clean Up was a great success on Sat. Sept 29. Nine outstanding Dawnbreakers, family, & friends did quick work on our section of Rakow Road, finishing well ahead of the estimated 2 hours. The weather was outstanding as well. Service Before Self! We were lucky enough this morning to have Holly from Habitat for Humanity of McHenry County speak and tell us about all the work being done in the area. Will the Dawnbreakers be taking part in the construction of a home?? Stay tuned to find out! Dawnbreakers Working on Their Flexibility! 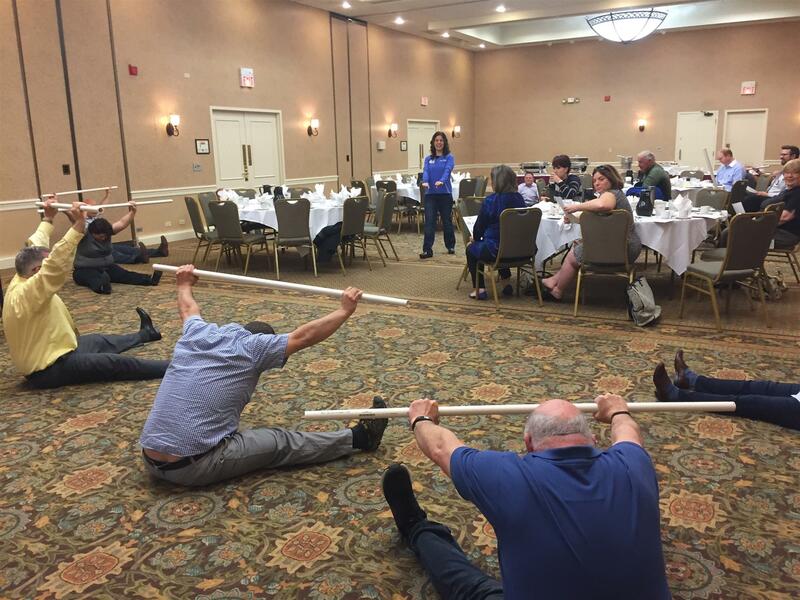 Last Wednesday, Denise Smith from Smith Running & Physical Therapy led The Dawnbreakers in some early morning stretching. Join us every Wednesday morning at 6:30am for all the fun and fellowship! 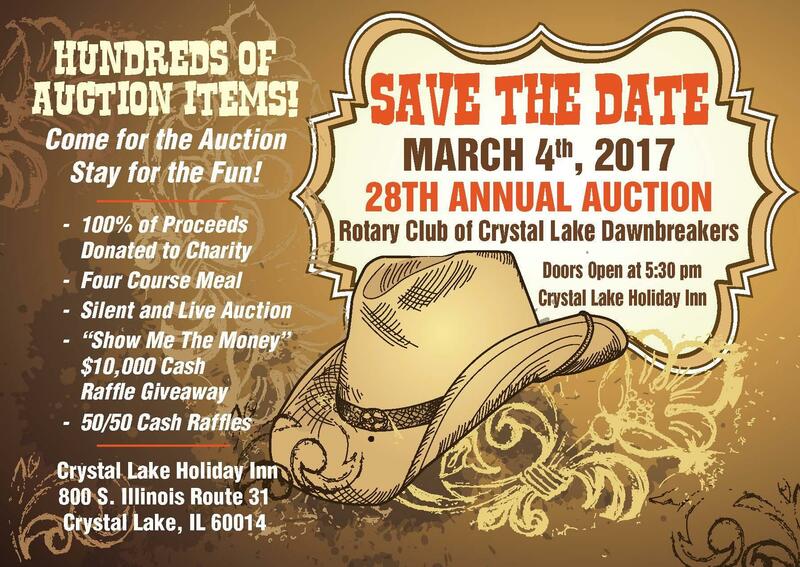 Rotary Club of Crystal Lake Dawnbreakers is proud to host the 28th Annual Western Auction on Saturday March 4, 2017 at the Holiday Inn in Crystal Lake. Over the course of 28 years, the Dawnbreakers have donated over $1.5 million to charity, both locally and globally through the Rotary International initiatives, from money raised at the auction. 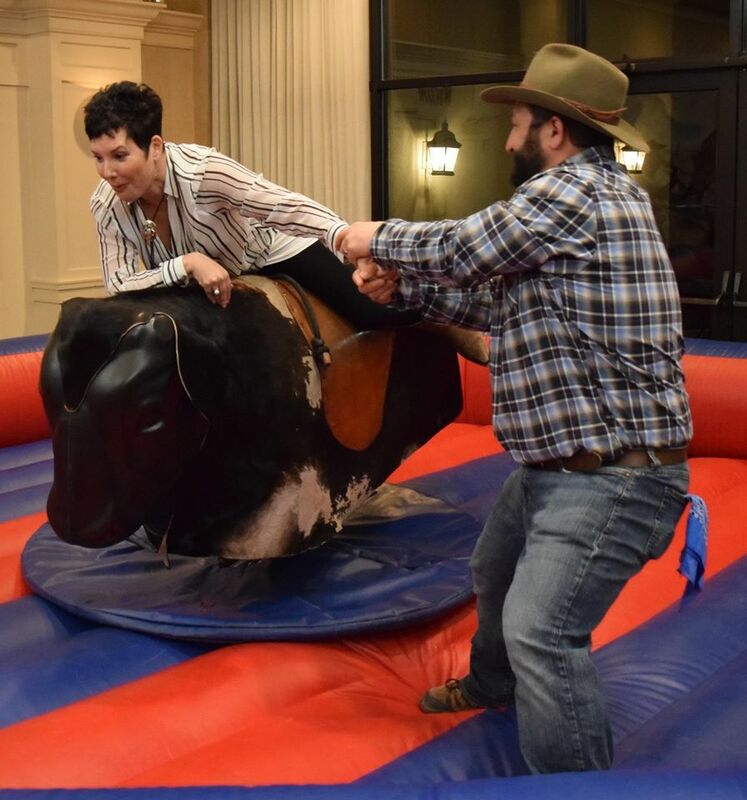 This year, the auction will include dinner, silent and live auctions, a "Show Me the Money" $10,000 cash raffle, 50/50 cash raffles, and a mechanical bull. Those interested in attending can view auction items, purchase tickets, and register for night of bidding on the Auction Website at Bidding for Good. Updates are made daily, so continue to check the site! 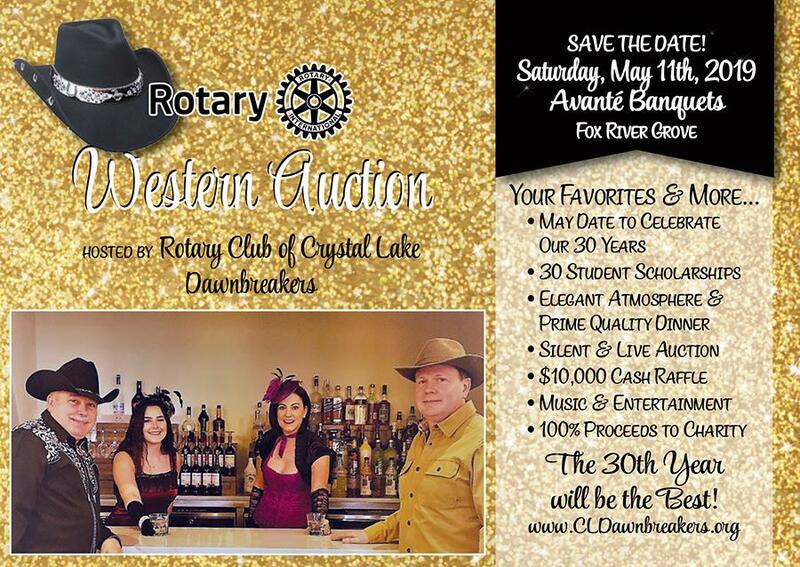 Please join us for a night of fun that truly lives up to the Rotary motto of "Service Above Self!" 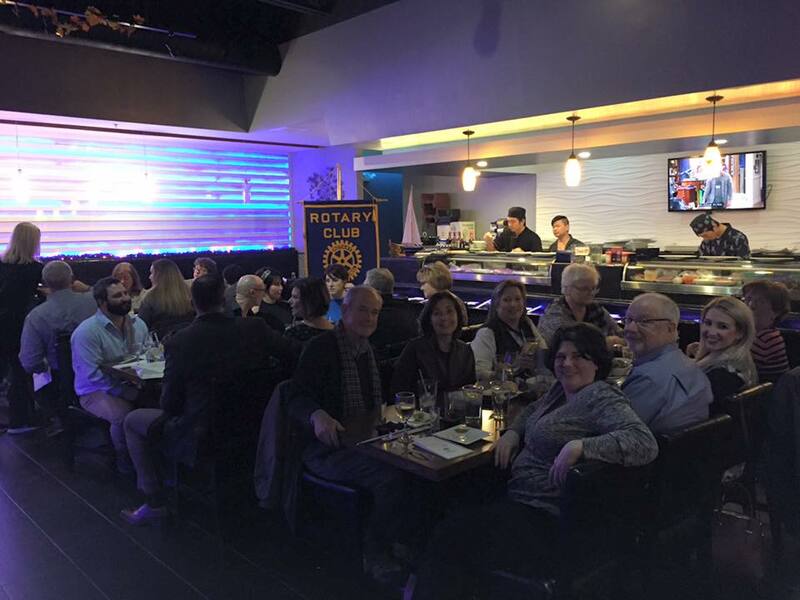 Dawnbreakers gather for dinner, fellowship, and something new at Kumi Sushi! Experts were on hand for the sushi-saki tasting. 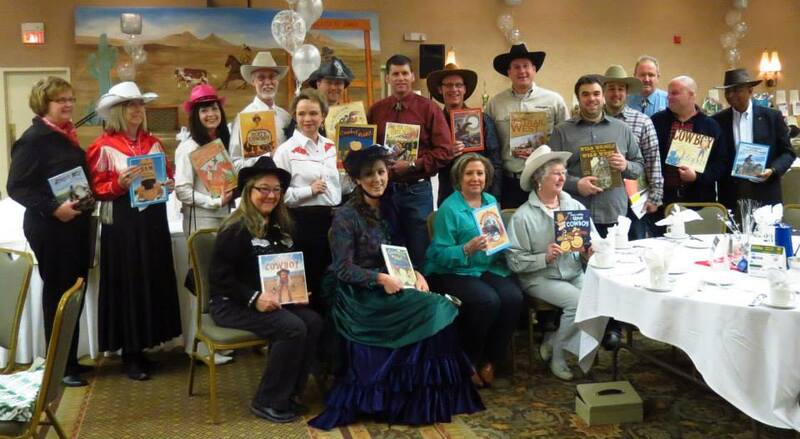 The 28th Annual Western Charity Auction and Dinner will take place on Saturday March 4th from 5:30-10pm. Attendees can expect a four course meal, a live and silent auction, 50/50 Cash Raffle, A Show Me the Money Cash Raffle, and much more! 100% of proceeds from the night will be donated to charities. Talk to your favorite Dawnbreaker or visit the auction website, https://www.biddingforgood.com/auction/auctionhome.action?vhost=dawnbreakers, to purchase tickets and view gifts. Dawnbreaker Kate Romutis accepts her Paul Harris Fellow Award. The Paul Harris Fellow acknowledges individuals who contribute to the Rotary Foundation of Rotary International. 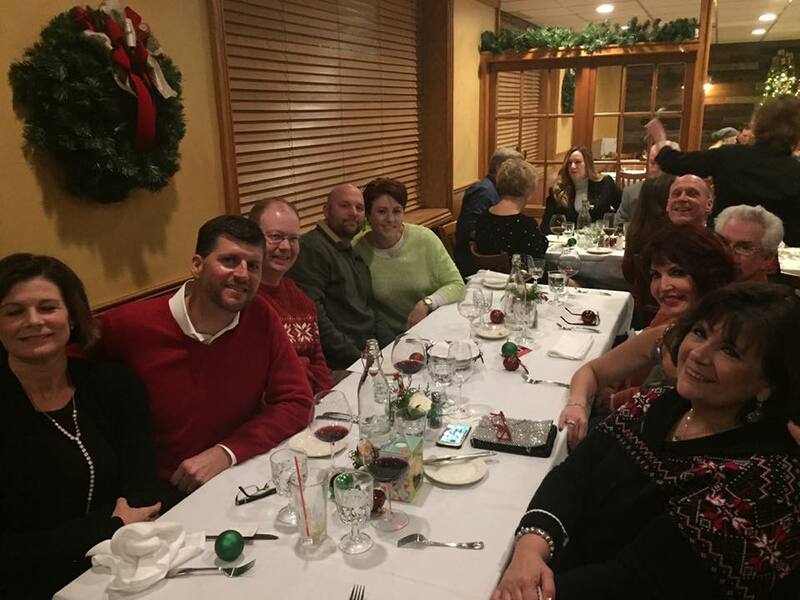 Dawnbreakers having a great time at the Holiday Dinner! 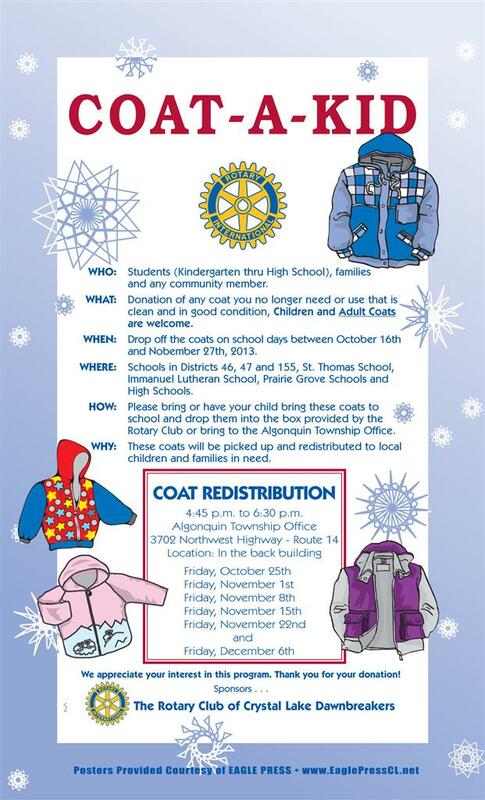 Just in time for the cold and snow! 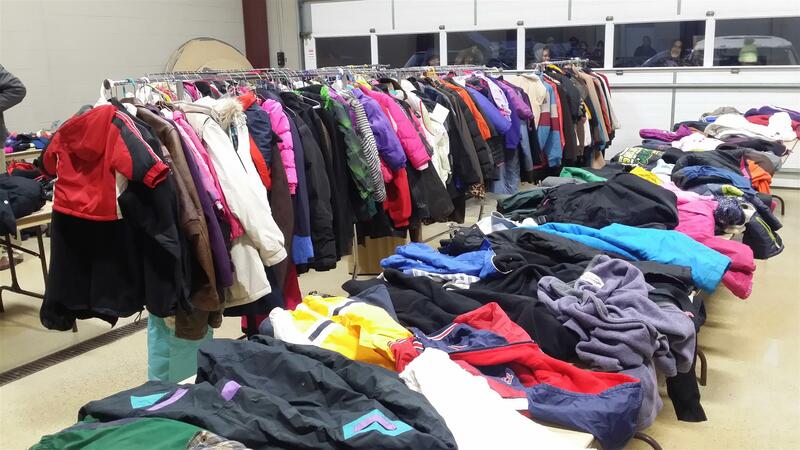 The Dawnbreakers distributed hundreds of coats to those in need this season. 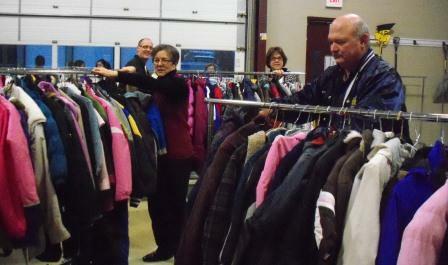 Thanks to all those that donated to Coat-A-Kid! 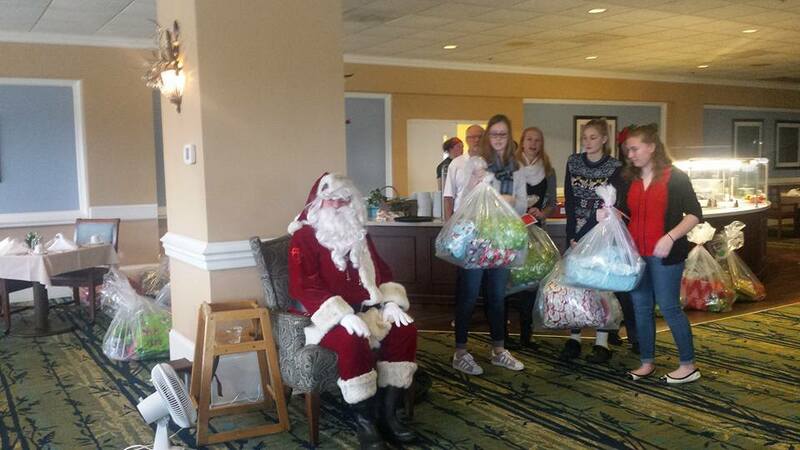 Interactors and Dawnbreakers Welcome Santa Claus! 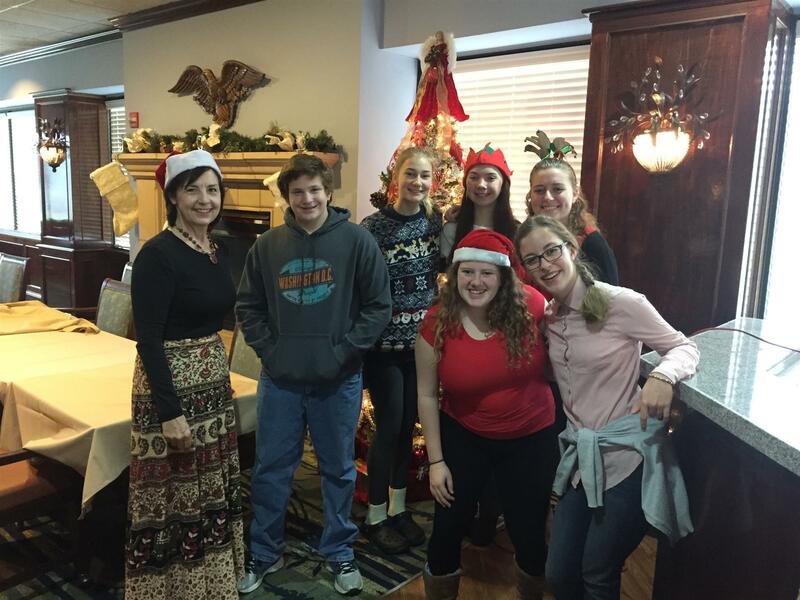 Interactors from Crystal Lake Central and Prairie Ridge came together to help the Dawnbreakers at the annual Breakfast with Santa Event. This year, 39 children were invited with their families to attend the event. Everyone ate, sang, and had a great morning! The Dawnbreakers gave their Four Core Charities checks on Wednesday November 23rd, totaling $20,000. 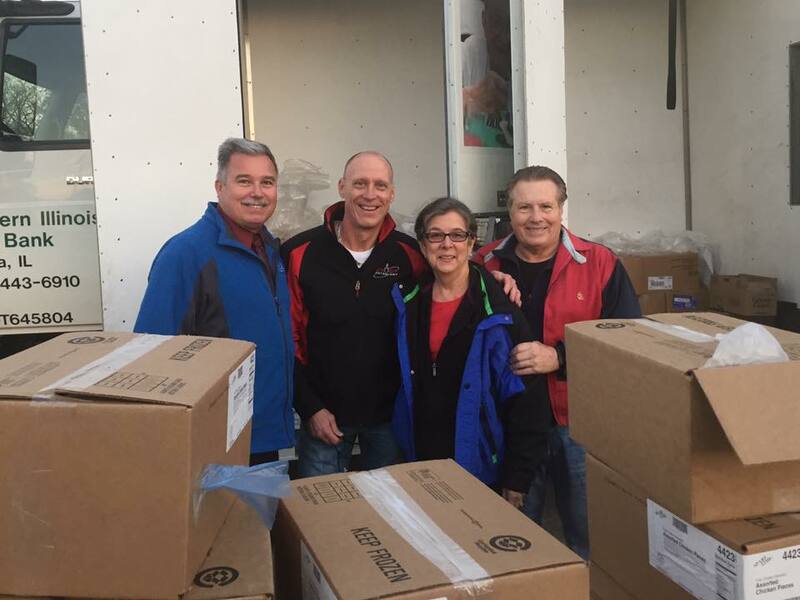 We are proud to support Big Brothers Big Sisters of McHenry County, Northern Illinois Special Recreation Association (NISRA), Bravehearts Therapeutic Riding and Educational Center, and Crystal Lake Food Pantry. 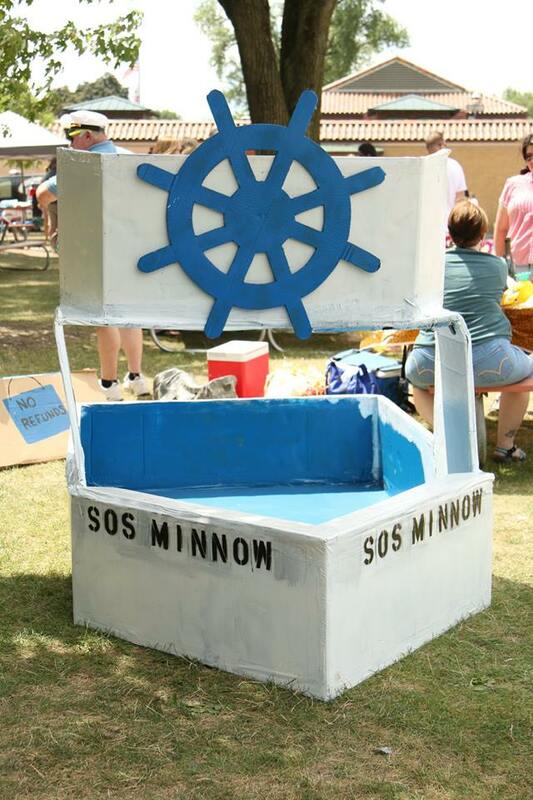 The money donated will help each organization with scholarships, special projects, and operational costs. Thank you for all you do in the Community! CL Dawnbreakers helped distribute food for those in need at the Sage YMCA. 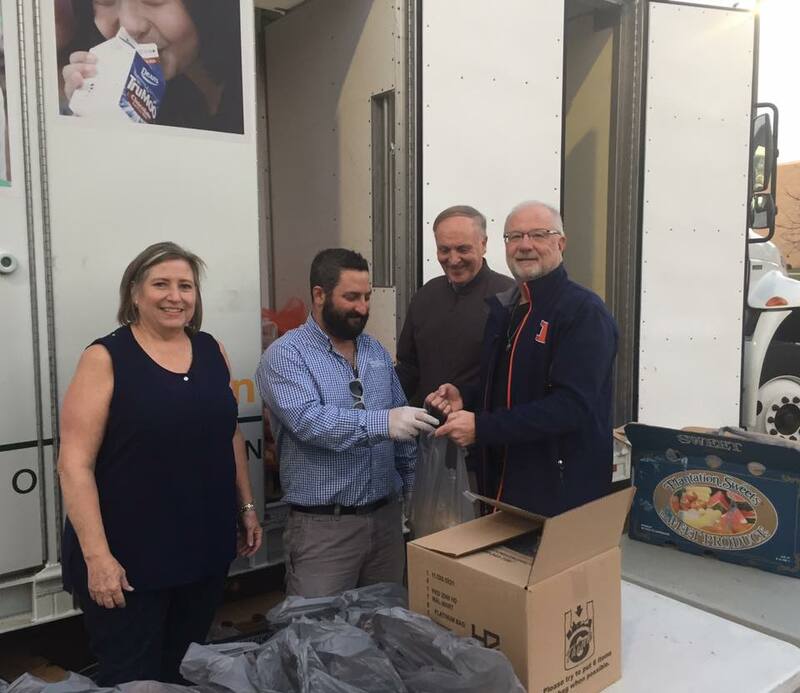 Just in time for Thanksgiving, over 50 families were able to to collect fresh and frozen foods. 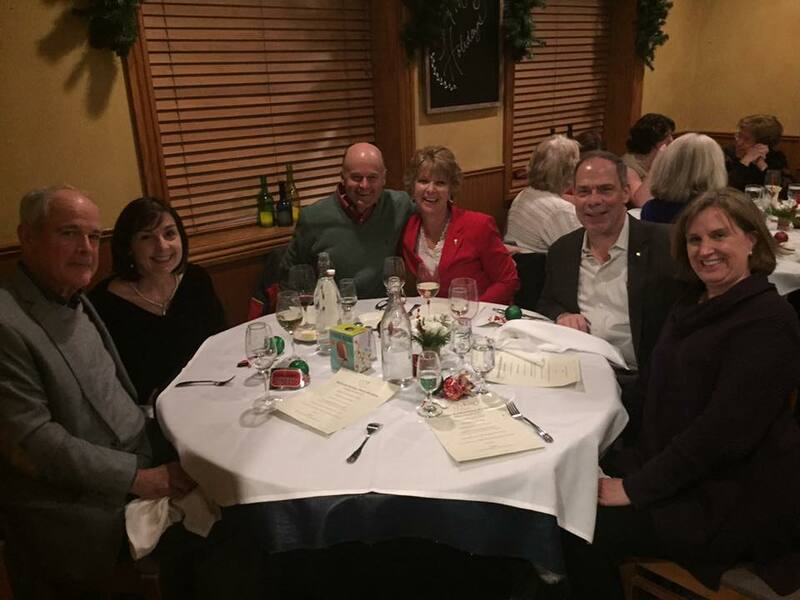 On November 2nd, District Governor Rick and Assistant Governor John came for a visit to talk to the Dawnbreakers about current projects, and the future of Rotary. Join us in our annual Coat-A-Kid event! New member Ryan Yantis was inducted into the club on Wednesday October 12, 2016. Welcome to the Dawnbreakers, Ryan! 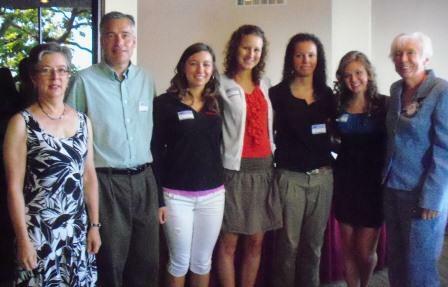 The Dawnbreakers partnered with Walgreens and Centegra at the Sage YMCA. 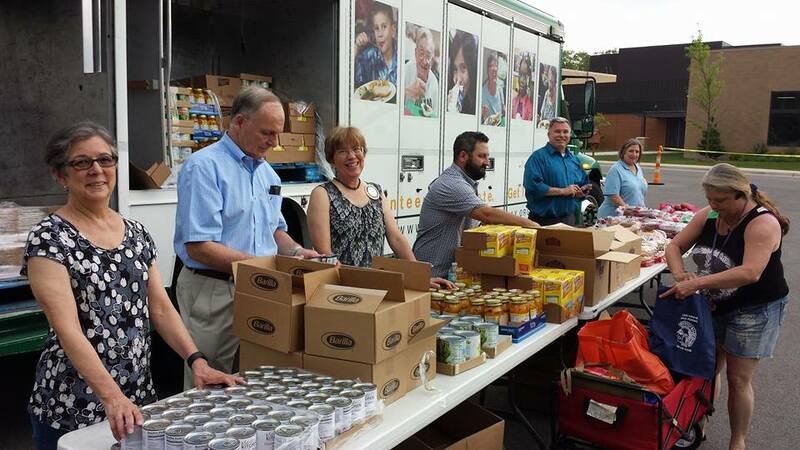 The Rotarians handed out food from the Illinois Food Bank Truck before the storms moved in. 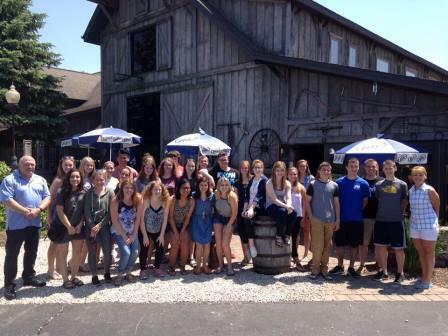 Crystal Lake Central HS Interact Club and Prairie Ridge HS Interact Club year end party at Nicks Pizza sponsored by Rotary Club of Crystal Lake Dawnbreakers!! Great fun! 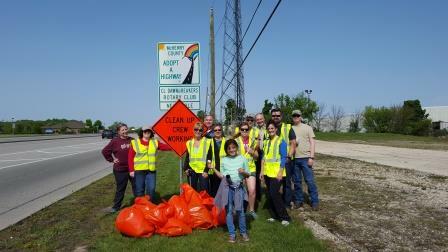 Dawnbreakers had a beautiful day to cleanup Rakow Road. Many hands made easy work. 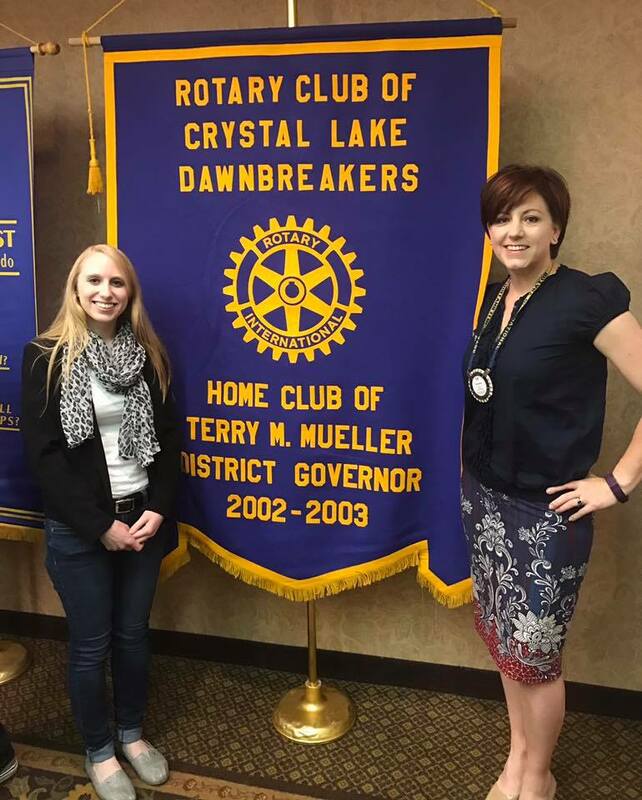 Did you know that the Crystal Lake Dawnbreakers sponsor the Crystal Lake Central High School, Interact Club? A few of their 50+ members stopped by today to discuss their upcoming projects. Governor Rodney Adams and Foundation Chair Terry Mueller award the CL Dawnbreaker's newest, Paul Harris Major Donors! Receiving the awards are Gary and Sue Reigler, Judy Sedlack and Marla Strauss. 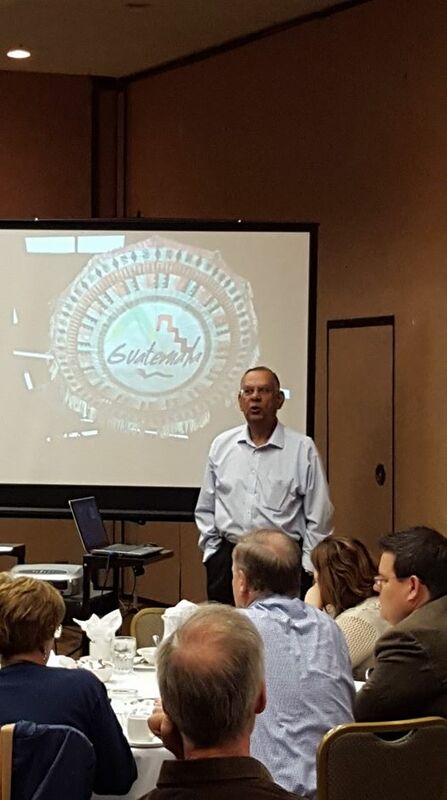 Narayan Murarka of the Barrington Breakfast Club, updates the club about an international clean water and malnutrition program that we help fund in Guatemala. This is the fourth international program that we have supported due to, Narayan's passion for helping the global community. Narayan exemplifies, Service Above Self. 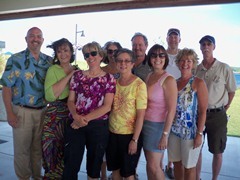 The Dawnbreakers recently funded a much needed, battery for the CL Park District's Segway. 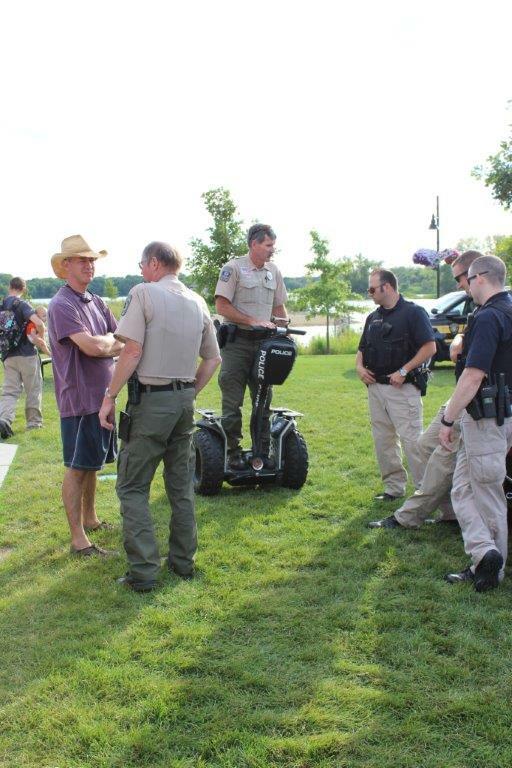 Pictured is, Officer Cipri on National Night at Three Oaks Recreation Area. 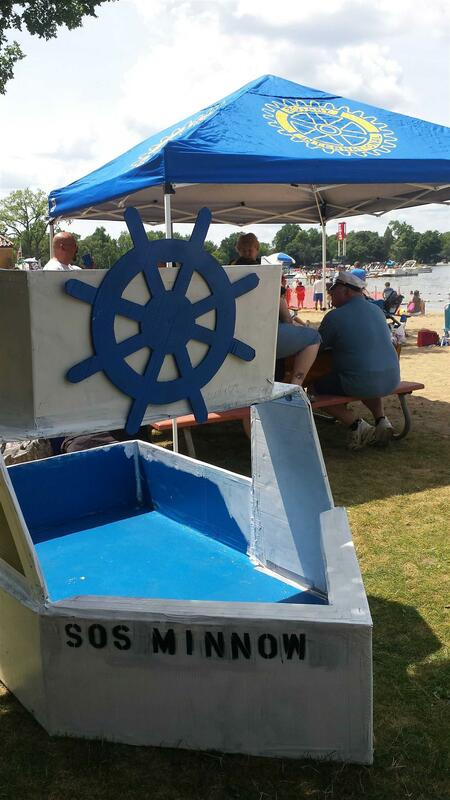 Thanks to the Crystal Lake Park District for keeping our parks and recreation areas safe! 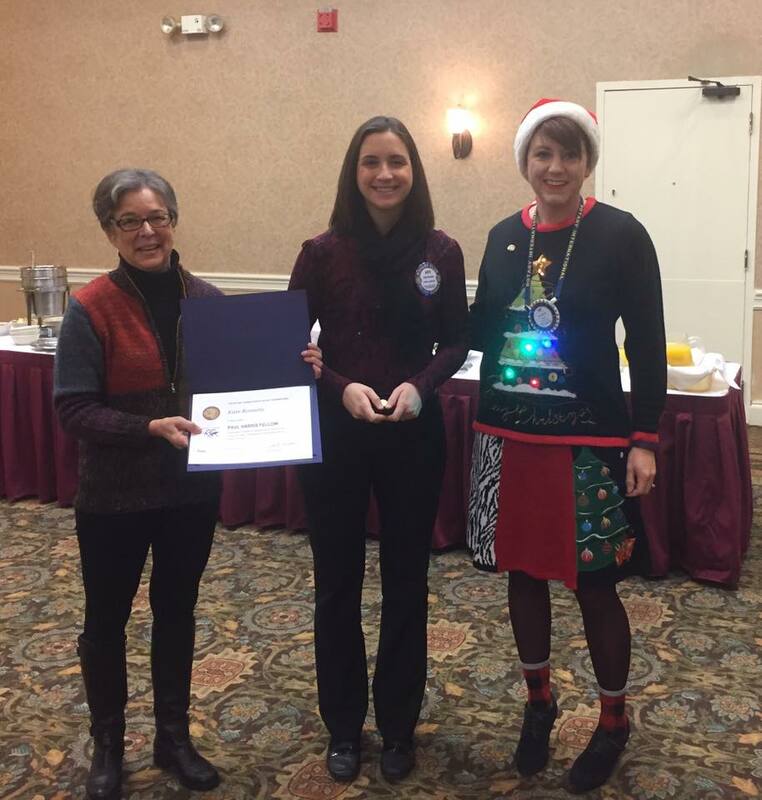 District 6440 Governor Sarah Oliver awarded the Rotary Club of Crystal Lake Dawnbreakers the 2013-2014 Presidential Citation with Distinction this morning. Only 5 clubs in the district earned this honor! Pictured is Governor Sarah with Dawnbreakers President Mary Bishop accepting on behalf of the club. Dawnbreakers shared in congratulating fellow Rotarian, Cliff Jackson, on being presented with the NISRA Compassion award for 2014. RI President-elect Gary C.K. Huang chose Light Up Rotary as his theme for 2014-15. Huang was inspired by the teachings of Chinese philosopher Confucious who said: "It is better to light a single candle, than to sit and curse the darkness." "There are so many problems in the world, so many people who need help. Many people say, 'There's nothing I can do.' So they sit there doing nothing. Meanwhile everything stays dark," Huang told the 537 district governors and their spouses and partners who are attending the 2014 International Assembly in San Diego, California. "The Rotary way is the Confucius way. The Rotary way is to light a candle. I light one, you light one, 1.2 million Rotarians light one. 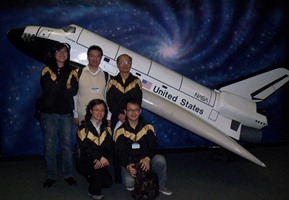 Together, we light up the world," said Huang, who is a member of the Rotary Club of Taipei in Taiwan. After announcing his theme at the opening session of the five-day training meeting, Huang urged club members to Light Up Rotary in the coming year by hosting a Rotary Day in their community and including local Rotaract and Interact members in their service projects. "How you Light Up Rotary is up to you," Huang said. "You know where you are strong, you know what your community needs, and you know how you can help." Huang also shared his membership development goals, including the need for more women and young adults and his goal to increase membership to a total of 1.3 million members. He asked Rotarians to invite their spouses, family members, and friends to join Rotary. "We need to assume leadership for building strong clubs, and that starts with bringing in new members," he said. Addressing the status of the fight against polio, Huang noted that with the current momentum Rotary is on track to achieve full polio eradication by 2018. "When we eradicate polio — and we will — we will have proved ourselves an organization capable of great things. And we'll be even better equipped for the next challenge we choose to take on. We'll have given the world a gift that will endure forever," he said. 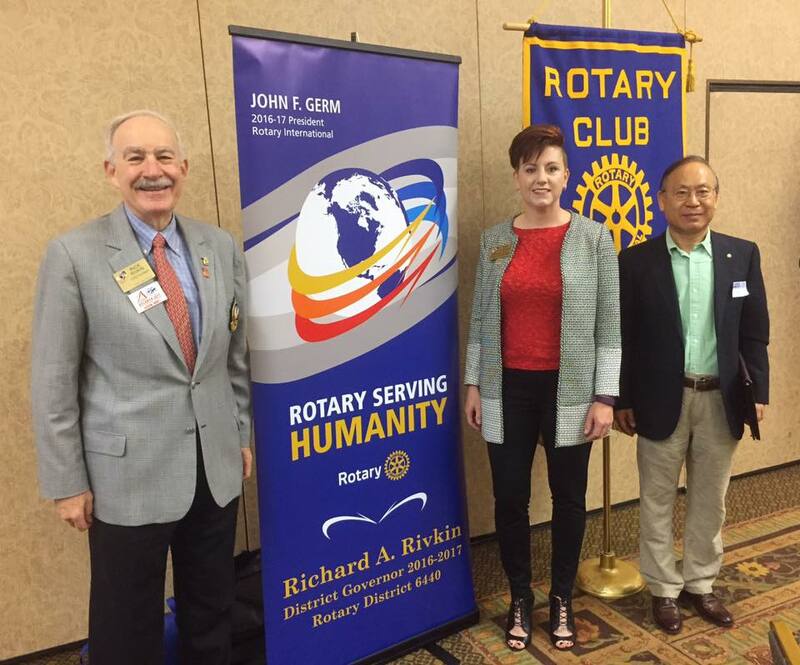 By continuing to fight against polio, setting an example in local communities, and growing membership, Huang hopes to see Rotary shine brighter than ever. "Light Up Rotary is our theme, but it is more than our theme. It is how we live in Rotary, how we think in Rotary, how we feel, how we work," Huang said. "It is how we make a difference — every day, in every club, every district, and every country where we serve." It was a busy morning on Nov. 27th at Dawnbreakers meeting. Four local charities received in total $16,000.00. Receiving funds ($4000.00 each) were: NISRA, Big Brother Big Sisters, Pioneer Center and Crystal Lake Food Pantry. 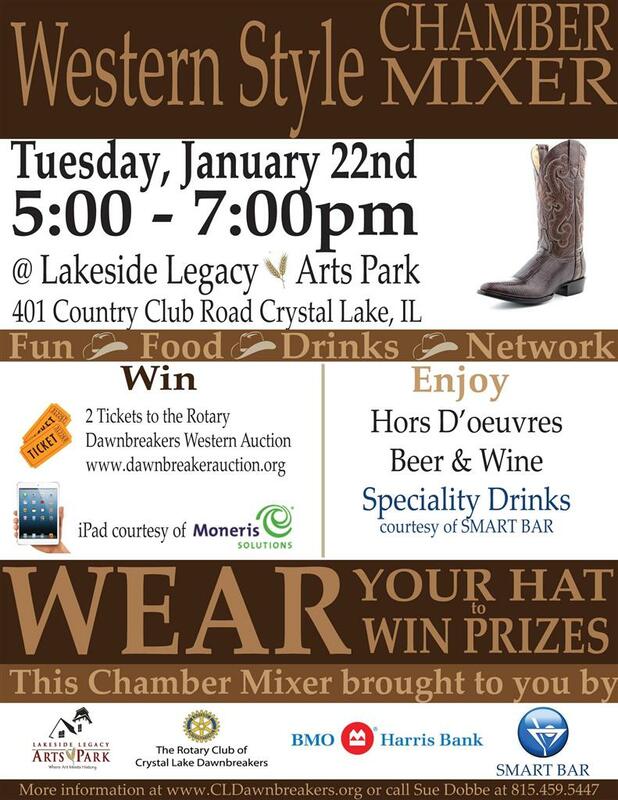 The Rotary Club of Crystal Lake, Dawnbreakers raises funds for local charities with their principal fund raising event being the annual Western Auction. The 2014 Auction will be held on March 1st. Please mark this date in your calendars and join the Dawnbreakers in a fun night collecting for local charities. Over last 25 years, more than One Million Dollars has been raised for the needy at this event. Pictured from Left to right. 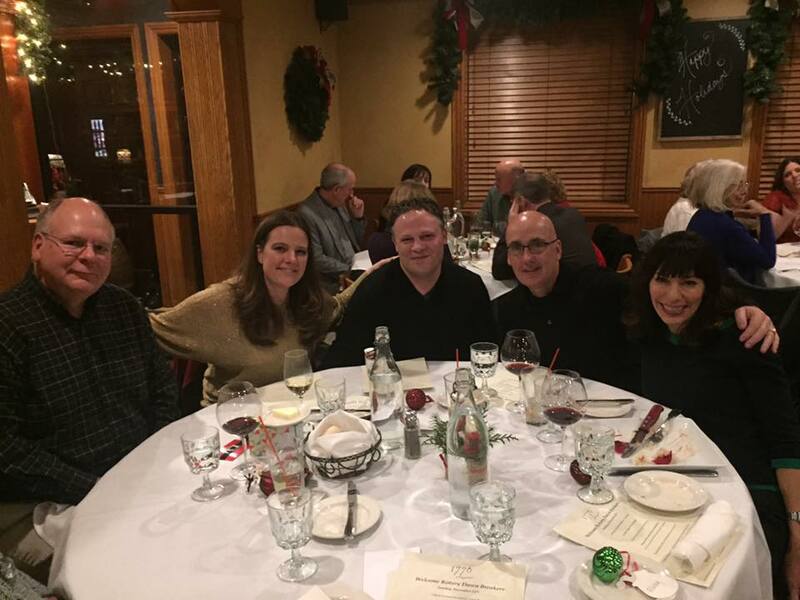 Rotarian - Mary Bishop, Brian Shahinian - NISRA, Dave Dauphin - NISRA, Joshua Baker -Big Brothers Big Sisters, Cate Williams - Crystal Lake Food Pantry, Patrick Maynard - Pioneer Center, Rotarian Kay Stanish. At their meeting on Wednesday Nov. 27th, The Rotary Club of Crystal Lake Dawnbreakers, awarded James Richter II, Assistant Director of Economic Development for the City of Crystal Lake, with the Rotary Vocational Service Award for 2013. 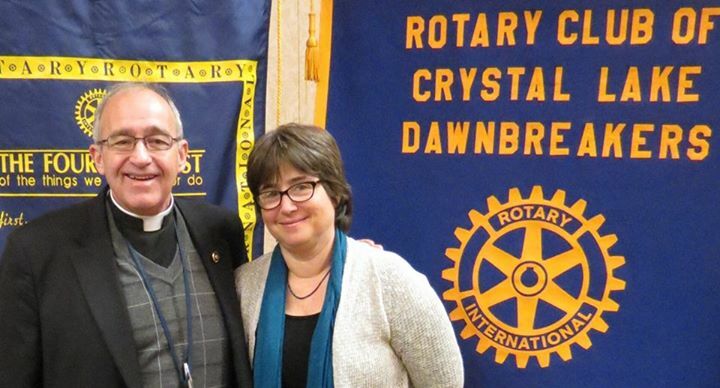 Pictured from left to right are Rotarian guest Father Jim Swarthout and Joanne Samuel Goldblum, Executive Director of the National Diaper Bank Network. They talked about success of National Diaper Banks with over 150 throughout the USA and thanked the Dawnbreakers for their support from early days of the Diaper Bank. Please visit diaper Networkwebsite for more information on great work done by Diaper Bank in helping needy families. 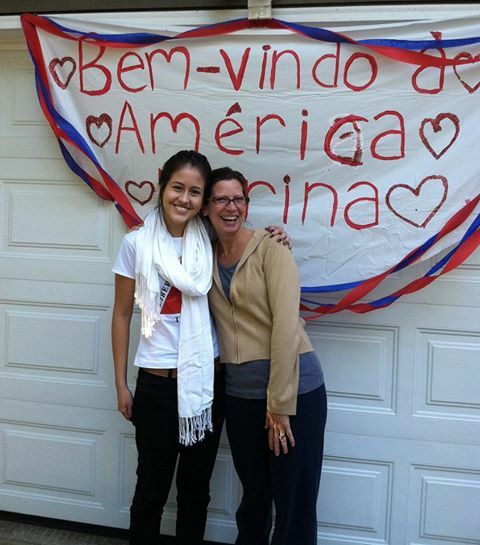 Welcome to Marina, 2013-14 Rotary Exchange student from Uberlandia - Brazil. Pictured from left to Right Marina Silverio and Kim Kerkbashian. Brett Gauger a student at MCC was awarded the 2013-2014 Joe Helbling Memorial Scholarship. This scholarship, awarded annually by the Dawnbreakers is valued at $1000.00 and can be awarded up to two times to the same recipient. This is the second time Brett has received this scholarship. Brett got 2 A's and a B in his course work in 2012-13. Great Job Brett! Brett is studying for his business associates Certificate in Management. 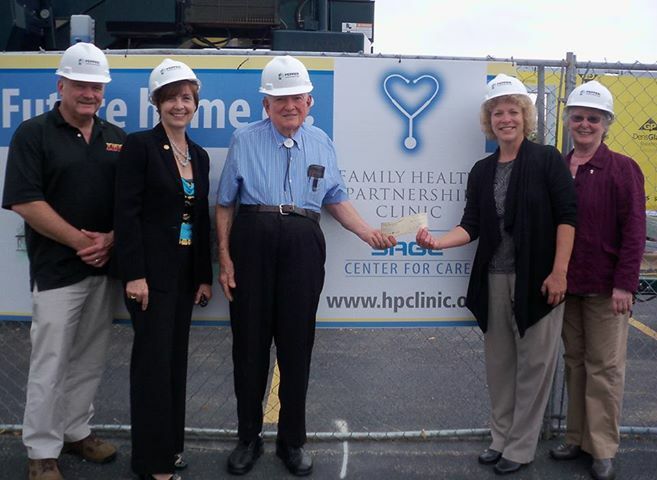 Ground breaking recognition of Dr. DuBose’s donation of $25,000 and announcement that match raised an additional $37,000 for construction of the new Family Health Partnership Clinic in Crystal Lake, today. 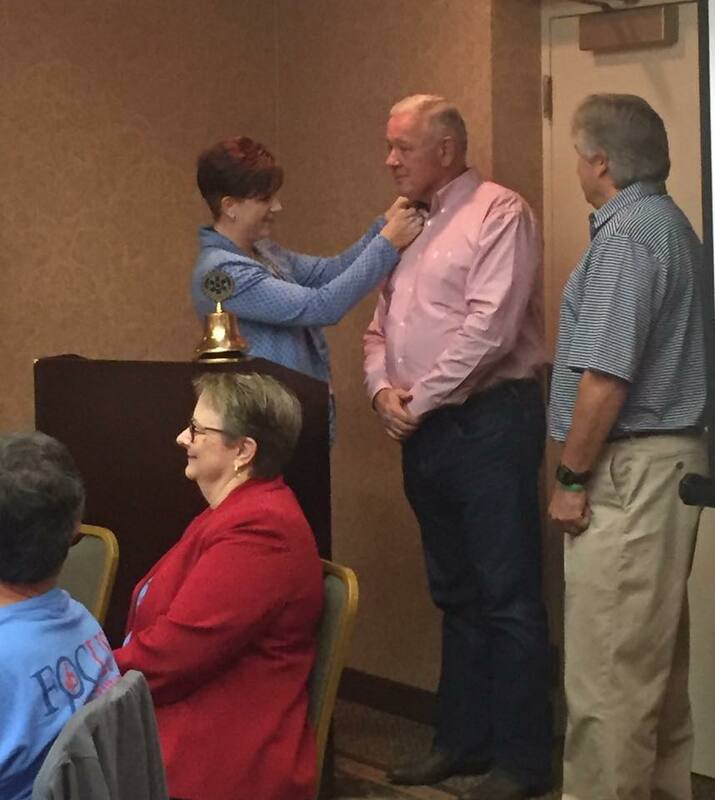 The Dawnbreakers had the honor of having District Governor Sarah Oliver induct our two newest members this week! 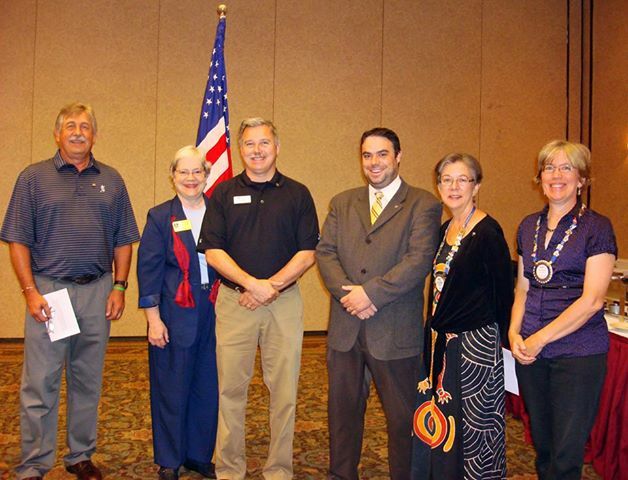 Pictured are Membership Chair Cliff Jackson, District Governor Sarah Oliver, new members Jim Wiseman and John Parisi, Past District Governor Terry Mueller and President Mary Bishop. The Dawnbreakers held their annual installation dinner on June 30th at Marzano's Restaurant. Soon to be Past President Gary Riegler awarded Mary Miller with the Rotarian of the Year award for all her many contributions to the club over the years. 2013-14 President Mary Bishop presents 2012-13 President Gary Riegler with a past president's plaque. Mary Bishop, Judy Sedlack and Terry Mueller with Scott Mueller Scholarship recepient, David Wales, at the District reception in Lisbon. 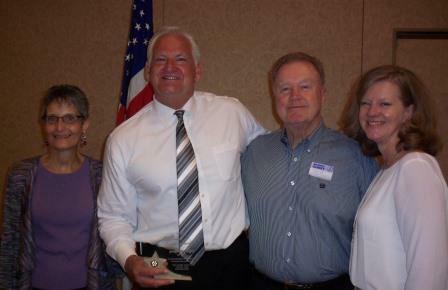 Mr. Joe Alger received the annual Vocational Service Award from the Rotary Club of Crystal Lake Dawnbreakers for outstanding service. Rotary promotes the dignity of each affiliate’s vocation and in celebration of this effort, the Dawnbreakers designed the Vocational Service Award to present to a member of the community who reaches out to train, inform and support people in achieving the best they can in various vocations. Joe Alger, COO of JA Frate, was a unanimous choice for this year’s award. 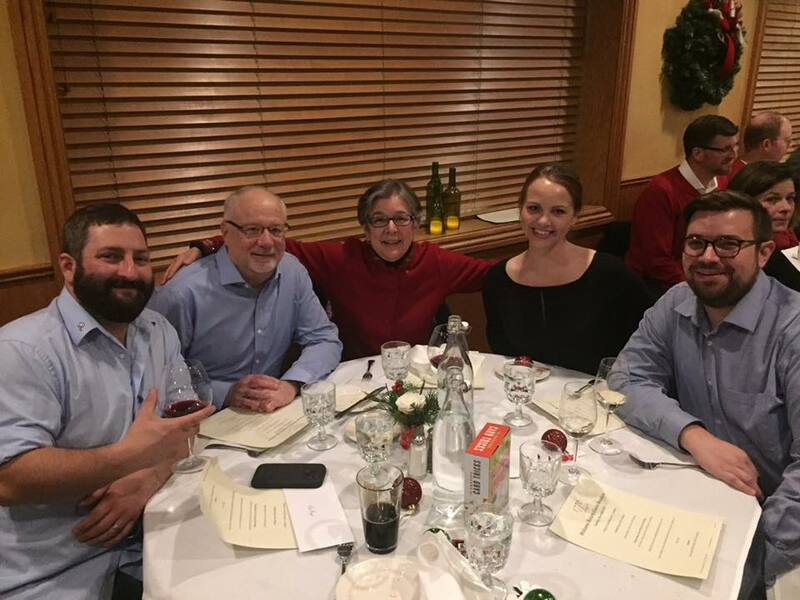 “JA Frate employees are trained to the highest driving proficiency standard to elevate their career path”, according to Jill Dinsmore, President. Alger encourages everyone to be team players who consistently give outstanding customer service and receive ongoing technical training so that their service is excellent and their fleet of vehicles is safe and well maintained. Alger is well known for serving veterans through the Patriot Guard Riders to honor military families and the Warriors’ Watch Riders, who organize homecoming ceremonies for returning solders with fellow Harley-Davidson riders. He reaches out to soldiers overseas through Operation Support Our Troops America and supports the Wounded Heroes Foundation which provides financial assistance and resources to wounded veterans. 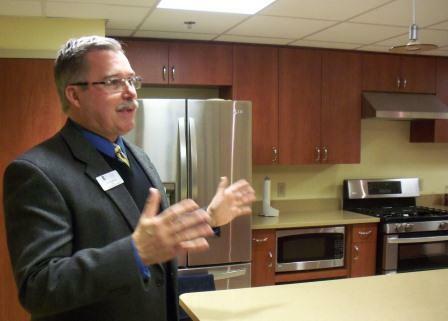 The Dawnbreakers are proud to honor Joe Algers with the 2013 Vocational Service Award. Awards night for the Read, Write and Win program sponsored by the Dawnbreakers, C.L. Library and McHenry County College was held Monday, April 22nd at Hussman School. The Dawnbreakers awarded $1,500.00 in prizes to the lucky winners. Students choose a book from a select few and write or illustrate the ending. Teachers from MCC judge the entries and select the winners. This year 150 students from District 47 participated in the contest. On Presidents Day we had a history lesson at the Illinois Holocaust Museum and Education Center in Skokie. Eva Ramos from Peru,(Crystal Lake Dawnbreakers), Naara Julia from Mexico (Palatine club), Ruben Jereves from Ecuador (Elgin Noon club), the Mark Billings family and Dominic Hagmann from Switzerland (Libertyville club) toured the museum. The history of Genocide; today and in the past was explained, discussed and for many, remembered. It was an amazing day and we recommend that everyone take a day to visit and learn so that history of this nature does not repeat itself. 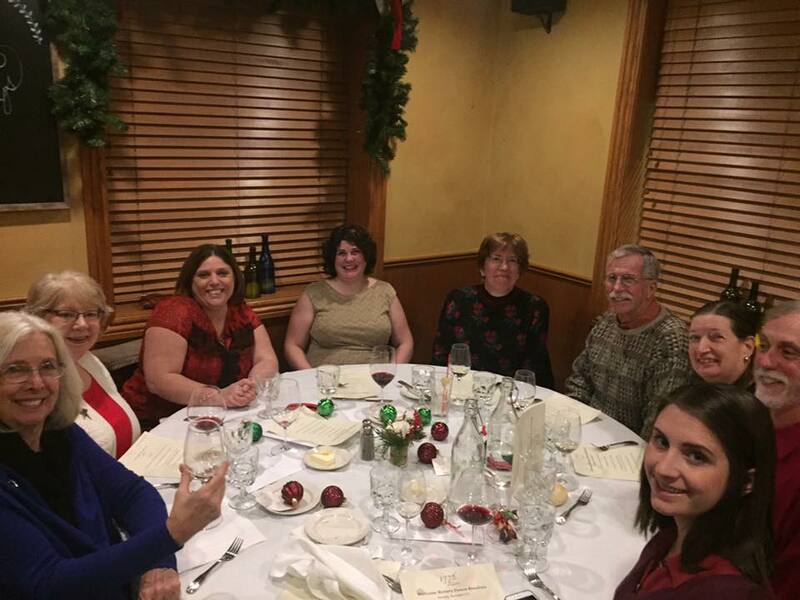 Representatives from NISRA, Home of the Sparrow, Pioneer Center, Big Brothers Big Sisters and the CL Food Pantry attended the Dawnbreaker meeting on November 11th. Each organization received a check for $5,000.00 as a Core Charity of the Dawnbreakers. 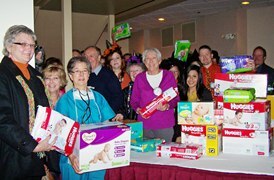 The Dawnbreakers held a diaper drive at their meeting on Halloween. A doctor, golf pro, bunny, casino boss, several witches, Little Red Riding Hood and club members bought and donated diapers to the St. Paul Diaper Bank of McHenry County. 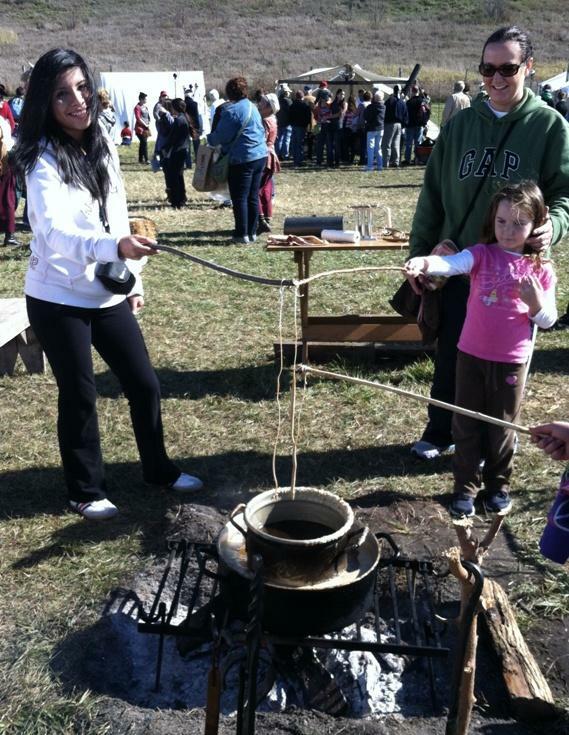 Eva, our youth exchange student from Peru, enjoyed making a corn husk doll, dipping candles, playing games, and trying wild rice stew and root beer at the annual Trail of History, depicting life in this area between 1650 and 1820. 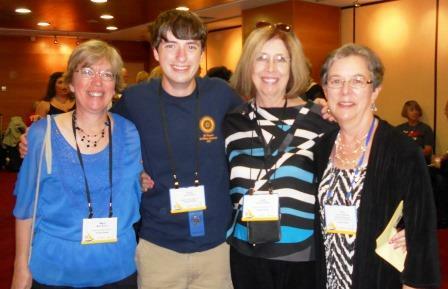 I found myself at the Rotary International Convention in New Orleans—a representative of the Crystal Lake Dawnbreakers—and my experience at the convention deepened both my understanding and respect for the organization immeasurably. Walking through the convention center, I saw booth after booth of Rotarians with programs all engineered at affecting social change in their communities in all aspects and seeking to share their unique programs with communities around the world. Having the opportunity to represent such a program with the Crystal Lake Dawnbreakers’ Diaper Bank, not only did I get to hang out with the coolest priest I’ve ever met, but I also got to feel the sense of pride and genuine investment Rotarians devote to their mission of “Service before Self.” As people passed by our booth and saw a table littered with diapers and a banner reading “Start a Diaper Bank!” the first question out of everyone’s mouth was unfailingly, “What’s a diaper bank? ?” (Complete with two question marks.) We’d smile and begin to explain the concept of collecting diapers through drives in the community and distributing them through an existing network of social service organizations, and we could see the realization dawn on their faces. Whatever they might have initially thought a diaper bank was, the reality was both more accessible and viable than they expected. The pinnacle of the convention was a speech by Bill Gates; and while I expected it would be a pretty big to-do, I was stunned by the sheer size of the hall we were in and the thousands of people in attendance. Over the loudspeaker we heard directions in several different languages instructing everyone which radio station they could turn to for a translated version of the ceremony; and although I had noticed various cultural differences (language barriers, etc.) throughout the week, I realized once again just how globally expansive Rotary International is and how many people from so many countries were all brought to one spot in support of a common cause. Bill Gates spoke to the room about Rotary International’s effort to eradicate polio, which has succeeded in reducing cases of polio worldwide by 99%, and insisted, “The last 1 percent will be the longest and hardest 1 percent.” The statistic evidence of the work Rotary has done to eradicate polio spoke for itself; and as we saw them flash across the video screens, the energy in the room was palpable. It was incredible to be in the presence of so many people gathered together to support one another in this collective effort, and I could see that all the good work that has been done thus far only motivates Rotary International and furthers their momentum in the fight against polio. As thousands of people celebrated the power of their togetherness and positivity and resolved to keep going further in the effort of “Service above Self,” I understood more fully than ever before that Rotary is both a local and global organization of human beings, using their strength to make change in the world; and I felt privileged to be able to participate. 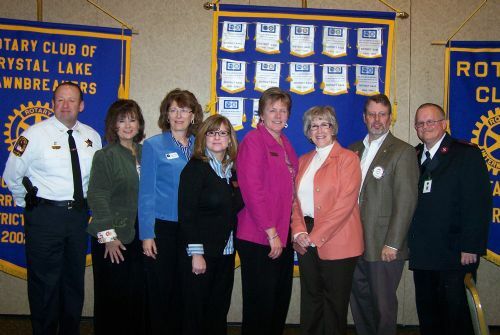 On December 16, 2009, the Rotary Club of Crystal Lake Dawnbreakers presented a check to the Friends of MCC Foundation matching $5,490 donated to the MCC Promise program. Crystal Lake Dawnbreakers are in Lisbon! great time at the Rotary International Convention! 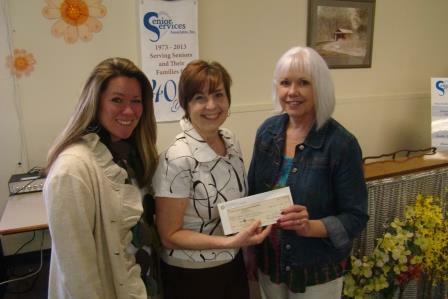 Dawnbreaker Sue Dobbe proudly presenting a check to Senior Services’ Meg Lamonica and Claudia Aquilina. 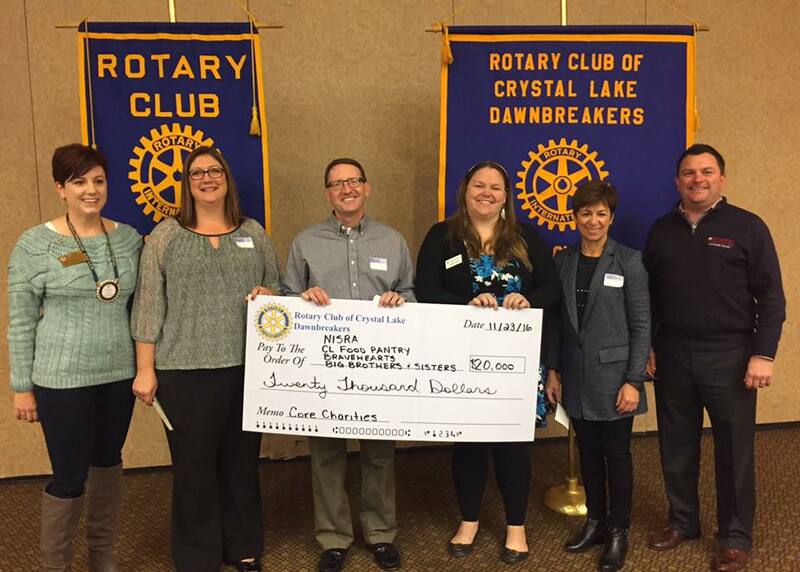 The check for $1000 is for the Senior Services Holiday Shopping Mall from Rotary Club of Crystal Lake Dawnbreaker's Charity Fund Board. 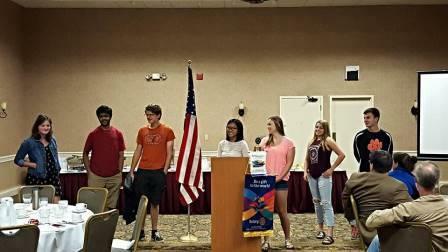 Four students from the local high schools were awarded their Scott Mueller Scholarship checks at a recent Rotary meeting. These students are well rounded, active in their school and community and have top grades. Each will be attending a four year university. Six checks are awarded yearly. One student received his check at an earlier meeting and one was attending Scout Camp. His father received the award in his place. Congratulations to all on a job well done in high school. Assistant Governor Don Brewer installed President Gary Riegler and the 2012-13 board of Rotary Club of Crystal Lake Dawnbreakers on a beautiful Sunday at Three Oaks Recreation Area. 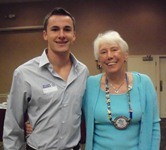 Nick Nissen from Prairie Ridge High School accepts his scholarship check from Rotarian Dee Meyer. Nick will be attending the University of Notre Dame suudying pre-med. Charity Fund Board President Gary presented Nancy Hiatt and Debbie DeGraw a check to buy equipment for Home of the Sparrow. Home of the Sparrow has been serving homeless women and children in McHenry County and northern Illinois since 1986. 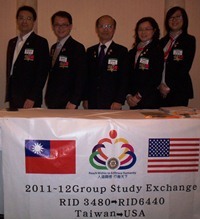 The Group Study Exchange Team from Taiwan gave an informative and entertaining presentation to 80 Rotarians and guests at D'Andrea's in Crystal Lake on May 2nd. Exchange Student Willem Groendijk from the Netherlands payed a visit to the Dawnbreakers on Wednesday, April 4th. Willem updated the club on his activities over the past 14 years including his studies, career and family. Rotary District 6440 is pleased to announce that The Rotary Foundation is now accepting applications for the world-competitive Rotary Peace Fellowship. The fellowship provides academic and practical training to prepare scholars for leadership roles in solving conflicts around the world. Up to 110 fellows are selected every year to earn either a master’s degree or a professional development certificate in peace and conflict studies. Fellows study at one of six Rotary Peace Centers at leading universities in Australia, England, Japan, Sweden, the United States, and Thailand. Watch as several Peace Fellows discuss the program and their work. 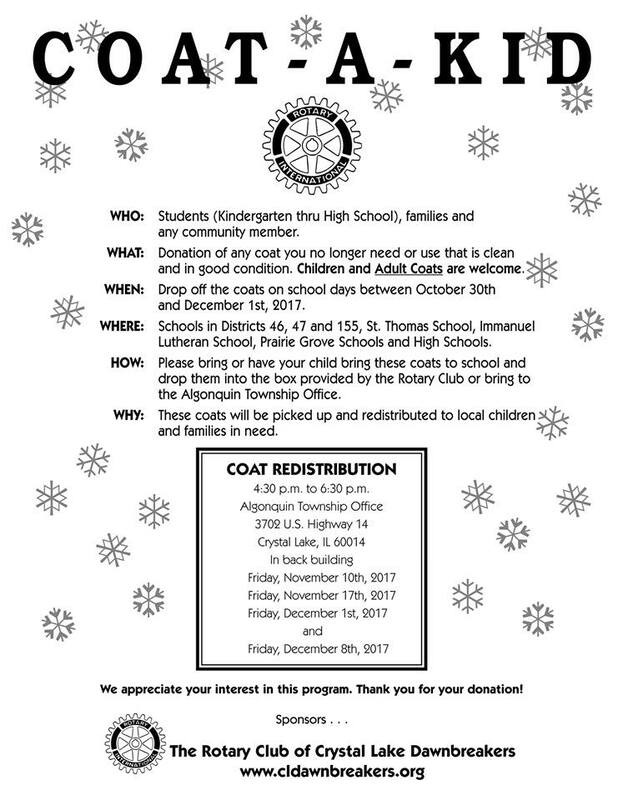 Applicants must be endorsed by a local Rotary Club and District. Contact Terry Mueller if you need more information about the District's application process. Applications are due to the District office by June 1. Applicants can learn more about the program at www.rotary.org/rotarycenters. Our Exchange Student has Arrived! 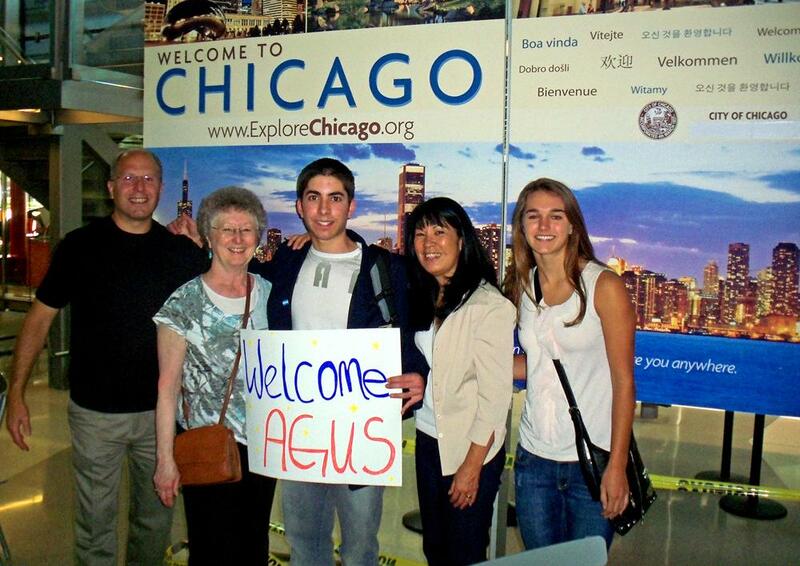 Agus, (Augustin Julian Santellan Fernandez) from Argentina, was greeted at O'Hare by Karen Hutchings, Youth Exchange Chair, Kevin and Ellen Bruning, his first Host Parents, and Melissa Thorpe, our outbound Exchange Student to Argentina last year. Welcome Agus! 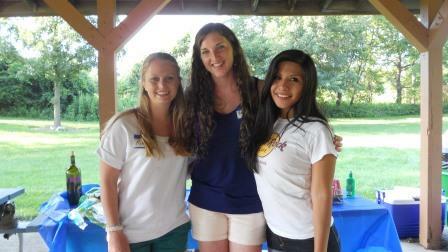 The Welcome Picnic will be August 18 at Veterans Acres Jaycee Pavilion at 6PM. Come meet Agus! 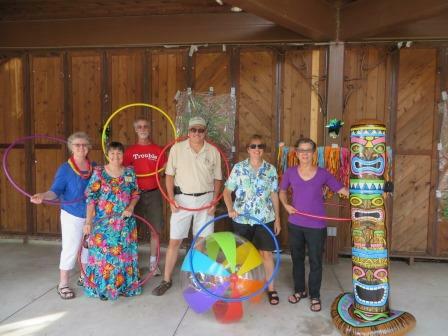 Dawnbreakers once again participated in the McHenry County Health Fair at MMC on August 3. Bilingual Englixh-Spanish Books are distributed to every family attending the Health Fair. Here, Marla and Connee attend the table at the entrance to the gym. Assistant District Governor Don Brewer speaks to incoming President Todd Schroll and the Dawnbreaker 2011-2012 Board at the Installation Dinner. Scott Block accepts a check for $2000 on behalf of the McHenry County Special Courts Fund. Dawnbreakers Connee Meschini and Penny Johns-Thompsen are seen representing the Dawnbreakers Charity Fund Board. 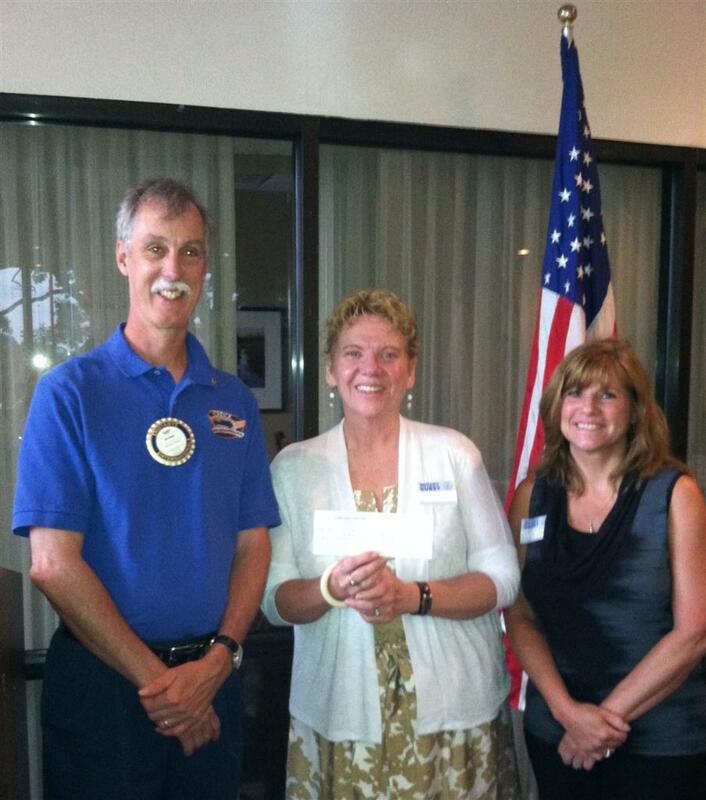 Peter Schmitz of CL Nutrition is the Rotary Club of Crystal Lake Dawnbreakers newest member! 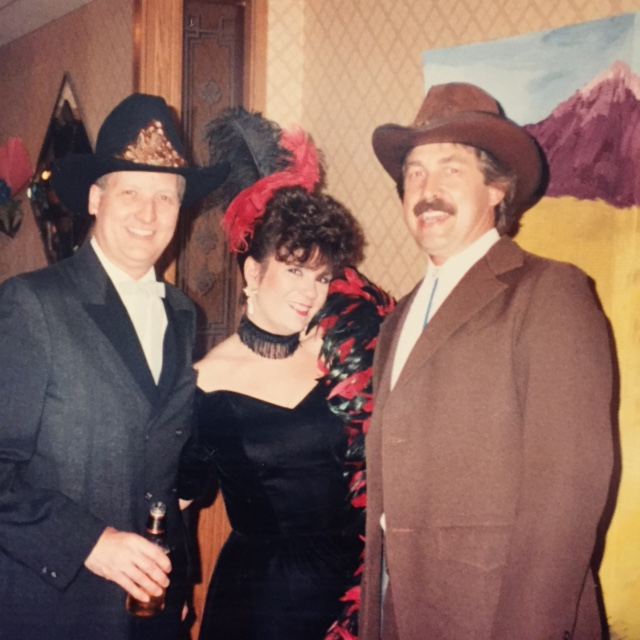 He is welcomed here by Gary Riegler and Sue Dobbe of the Dawnbreakers. Kathleen Stenberg exhanges club flags with Sue Dobbe of the Dawnbreakers. 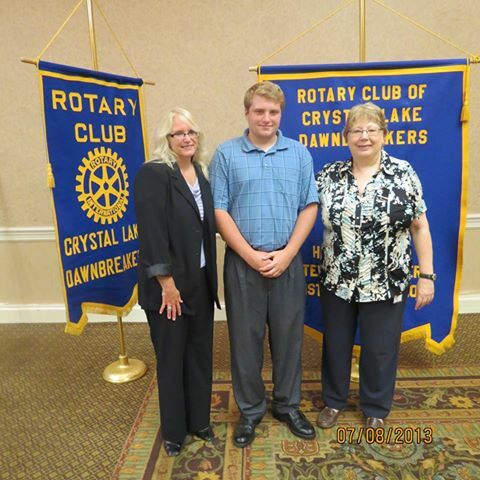 Nick was awarded the Rotary Club of Crystal Lake Dawnbreakers 2010 Vocational Service Award. * Adherence to and promotion of the highest ethical standards in all occupations, including fair treatment of employers, employees, associates, competitors, and the public. * The recognition of the worthiness of all useful occupations, not just those that are pursued by Rotarians. * The contribution of your vocational talents to solving the problems of society and meeting the needs of the community. 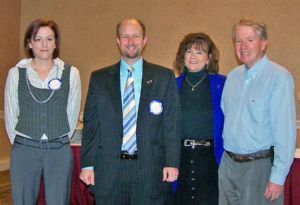 Nick attended the January 19, 2011 meeting and was presented the award by Krista Huffman. 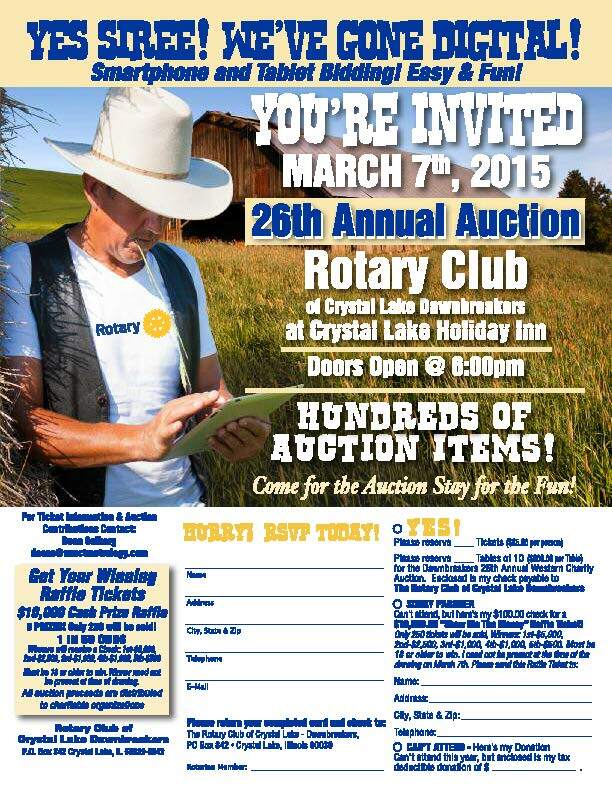 For 21 years the Rotary Club of Crystal Lake Dawnbreakers has been raising funds at their Annual Western Auction. 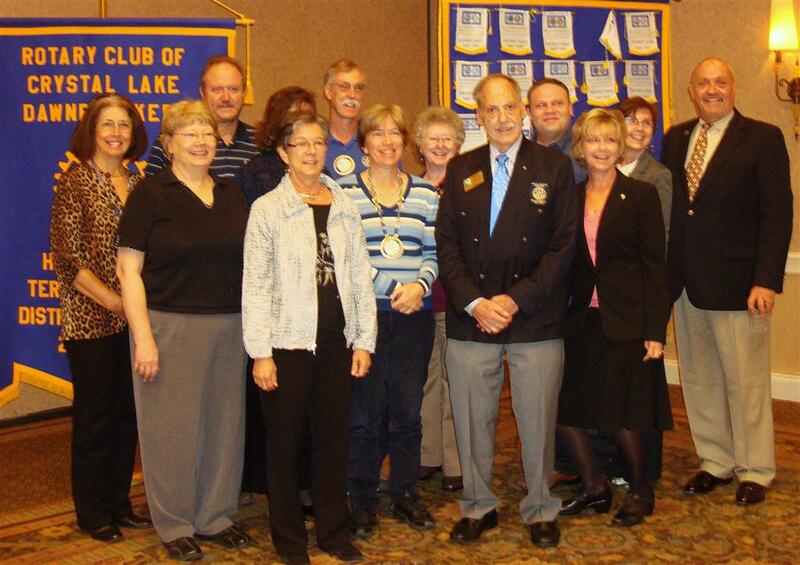 In 2010 over $77,000 was raised on one February night with more than 440 attendees at the Holiday Inn of Crystal Lake. 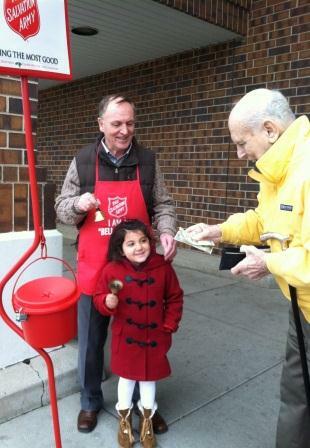 Each year, the funds are donated to charities, and this year was no exception. 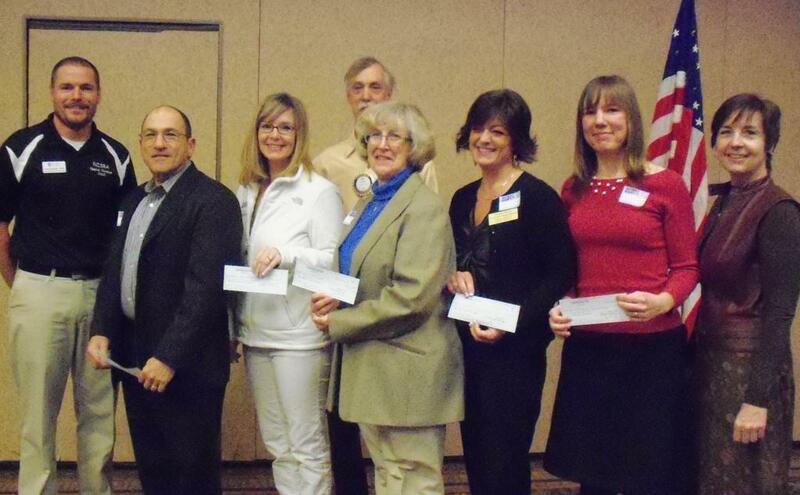 The day before Thanksgiving the club handed checks to six area charities for local support. 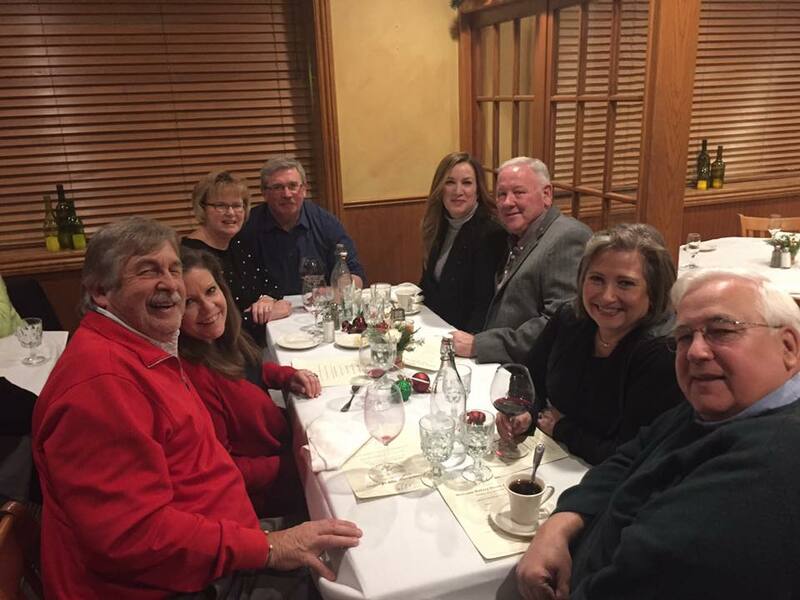 "We are grateful to the community that helps us raise these funds and grateful we live in such a wonderful, service-focused county," said club president Penny Johns-Thompsen. Checks for $3500 were given to Turning Point, Home of the Sparrow, Crystal Lake Food Pantry and Faith in Action. The Crystal Lake Police Department received a check for $2500 for their Early Intervention System and Salvation Army received $950 to support local families at Christmas. Additional donations will be given in future weeks to Hospice of Northeastern Illinois and NISRA. These are in addition to the club's commitment to educational scholarships through the Scott Mueller Scholarship and Joe Helbling Scholarship program. 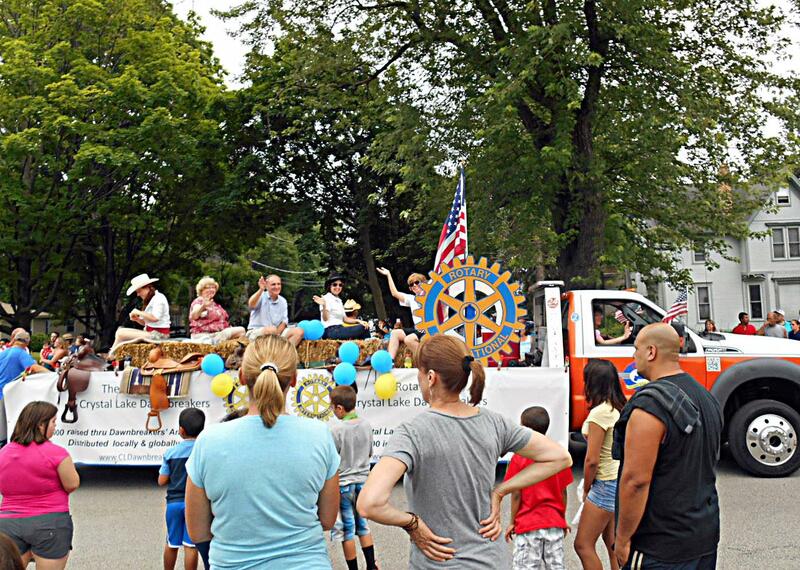 According to the club's Charity Fund president John Daly, giving back is at the core of Rotary. "Every dollar raised at the Annual Western Auction is donated. Service Above Self is the motto of our club and of Rotary International. 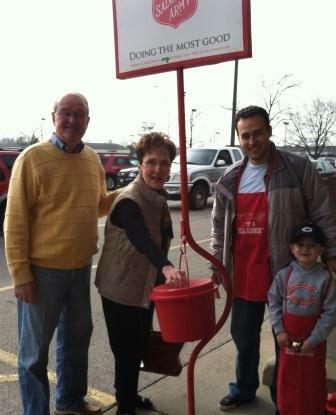 We raise funds in order to give back to the community and support Rotary around the world." The 22nd Annual Wester Auction will be March 5, 2011, and the club is committed to raising more than 2010. Auction Chair Cliff Jackson announced: "This year's goal is $100,000 as a start on the second million dollars raised by this club." The SAVE THE DATE Card is ready for Auction 2011 - To see it, save it and share it with your guests - Click here for a pdf file and here for a jpeg file. 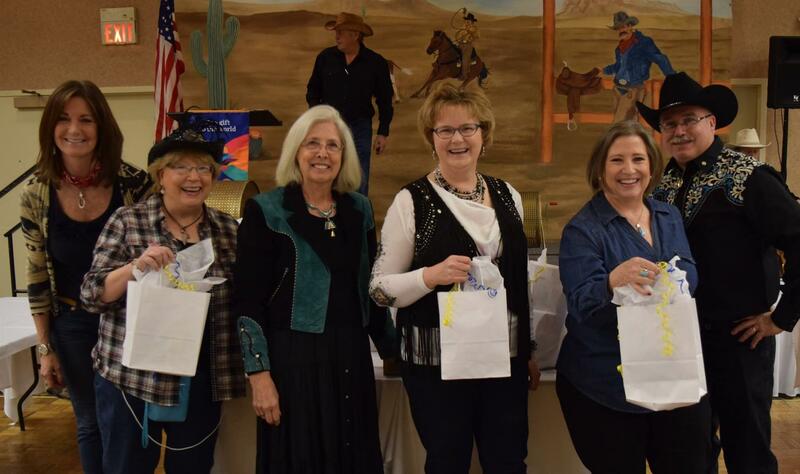 The Dawnbreakers inducted three new members on November 10. 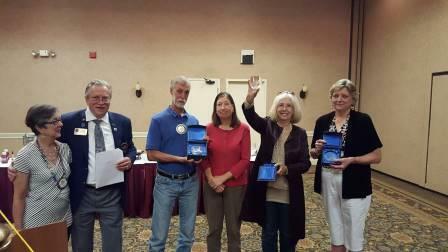 Kay Stanish, Chadwick Lech and Greg Johnson were welcomed into Rotary by President Penny Johns-Thompsen. On November 10 Past District Governor Bill Ferreira presented Dawnbreaker Past President Sue Dobbe with a District 6440 Presidential Citation for Dawnbreaker accomplishments during the 2009-2010 Rotary Year. Dawnbreakers and guests shared fellowship at a lovely Bonfire and dinner on a perfect autumn evening at the end of October. HERE are the pictures! of St. Mary Episcopal Church in Crystal Lake. Welcome Father Chip! The newest Dawnbreaker Members planned, prepared and presented a lovely fundraiser for End Polio Now on October 7, 2010, at the Crystal Lake Country Club with a Wine, Tequila, Scotch and Beer "Tasting" and more! of another fun Mystery Plane Trip weekend. Dawnbreakers enjoyed a beautiful day at Navy Pier, "Sailed Away" on one of the Tallships, listened to the bands and singers around Navy Pier and avoided the traffic with a comfortable bus ride. See the many pictures - click on "more". Kelsey has sent us a video of her Youth Exchange to Ecuador. Take a look! Melissa, our Outbound Youth Exchange Student has arrived in Argentina! Wine Tasting, Scotch, Beer & Tequila, 3 Course Dinner with Paired Wines, Live Jazz Ensemble, Keynote Speaker John T. Osterlund, General Manager of The Rotary Foundation of Rotary International. Thursday, October 7, 2010, 6:00 to 9:00 pm at the Crystal Lake Country Club. 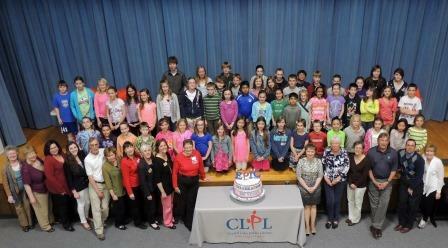 Area students recently participated in the Dawnbreaker's Literacy Program; Read, Write and Win! The students are assigned a book to read and asked to re-write the ending. The Main Stay Therapeutic Riding Academy recently received funding from the Dawnbreaker's Charity Fund for the purchase of saddle pads, halters and leads designed to work with special needs students. Accepting the gift from Rotarian Karen Hutchings was Roxie and a 19 year old working horse, Cowboy. 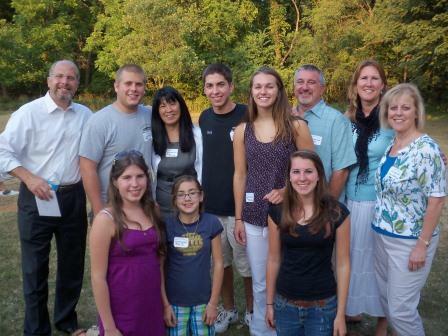 Click on "Youth Exchange" / "Kelsey in Peru" / "The latest news from Kelsey". 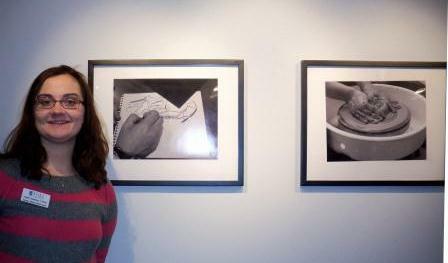 Her most recent report will make us all wish we could be Youth Exchange Students! The Dawnbreakers are once again so very grateful for the incredible support from our community at our Annual Charity Auction! We are thrilled with the success of this year's auction and we look forward to donating the proceeds to worthwhile organizations both locally and throughout the world. On December 16, 2009, the Rotary Club of Crystal Lake Dawnbreakers presented a check to the Friends of MCC Foundation matching $5,490 donated to the MCC Promise program. 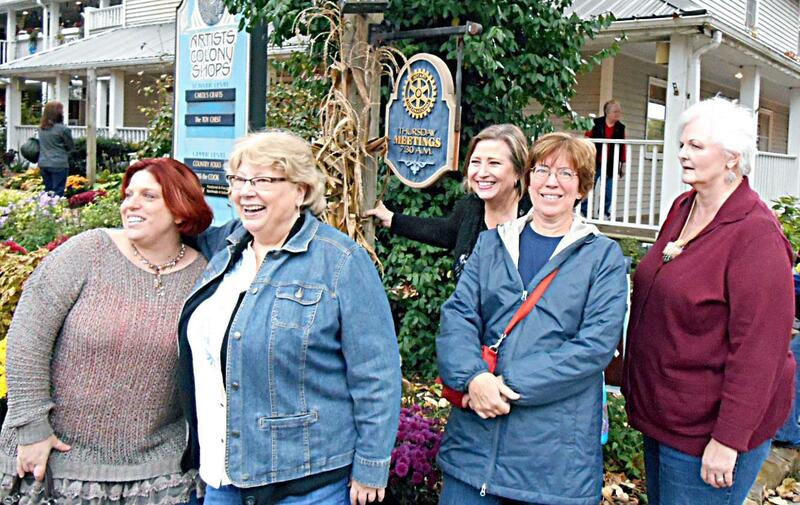 Pictured are: Dee Meyer, Dawnbreaker /MCC Promise Taskforce Leader, Mary Miller, Dawnbreaker & MCC Board, Bill Brennan Executive Director, MCC Promise, Karen Hutchings Dawnbreaker, Ron Koeller Crystal Lake Rotary Noon Club, Sue Kirby Dawnbreaker. 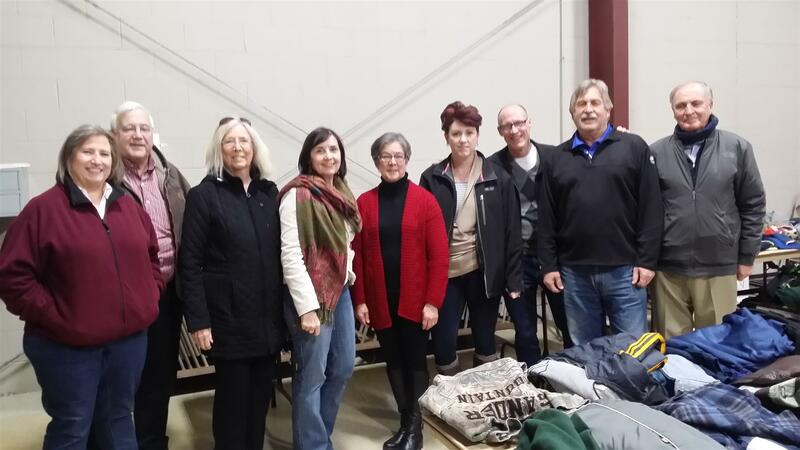 The Rotary Club of Crystal Lake Dawnbreakers supports Shelter Box, an organization dedicated to providing emergency shelter in areas hit by natural disasters. Click on SHELTER BOX under Club Links. Throughout Rotary's history, several basic principles have been developed to guide Rotarians in achieving the ideal of service and high ethical standards. The Object of Rotary was first formulated in 1910 and adapted through the years as Rotary's mission expanded. The Object of Rotary provides a succinct definition of the organization's purpose as well as the club member's responsibilities. The Object of Rotary is to encourage and foster the ideal of service as a basis of worthy enterprise and, in particular, to encourage and foster: FIRST The development of acquaintance as an opportunity for service; SECOND High ethical standards in business and professions; the recognition of the worthiness of all useful occupations; and the dignifying of each Rotarian's occupation as an opportunity to serve society; THIRD The application of the ideal of service in each Rotarian's personal, business, and community life; FOURTH The advancement of international understanding, goodwill, and peace through a world fellowship of business and professional persons united in the ideal of service. A group of Dawnbreakers had a fun weekend in Springfield visiting various Abraham Lincoln sites in honor of his 200th birthday thanks to our excellent trip planner, Judy Sedlack!Â Thanks Judy!Â To see some pictures, click on the "more". Dawnbreakers enjoyed a wonderful Oktoberfest Social with a great German dinner from Deeter's and plenty of Oktoberfest beer and wine!Â Many thanks to Sue Kirby, Club Service Chair, for organizing,Â and to Ron and Amy Tessler for hostingÂ a very entertaining social in true Dawnbreaker tradition!Â Take a look at the photos in the Oktoberfest Photo journal. The Rotary Club of Crystal Lake Dawnbreakers support a variety of organizations throughout the community including the Raue Center For The Arts.Â Pictured here are Dawnbreakers who joined in the annual Stargazers Ball recently held at the Boulder Ridge Country Club.Â Â The evening's event represents the kick-off of the theaters new program season.Â Â Rotary Dawnbreakers have selected the Raue's Mission Imagination program for children as one of its core charities.Â Â Through their contribution, Dawnbreakers are able to assist the Raue with various program materials for this worth while arts education program for area school children. The Dawnbreaker Auction Pig Roast won by Home State Bank was a success thanks to Mary Bishop!Â It was held at Veterans Acres on September 13 and featured a whole piggy in the roaster after a last minute scramble by Mary when the original purveyor suffered a heart attack. Fr. JimÂ kicked off his Diaper Bank project with a presentation at the September 9 meeting andÂ an invitation toÂ the Dawnbreakers to help him in his efforts to "stock the shelves" of the first Diaper Bank in Illinois!Â Dawnbreakers answered the call and brought diapers, diapers, and more diapersÂ on Wednesday morning - over 4,500 diapers!Â Click More to see additional pictures.